Helen Foster – Ceramics Click to see a larger image. …ever since she first “discovered” it when studying for “O” Grade Art at school. Over the years that followed, she took numerous evening classes and sought opportunities to work on her own ideas whenever, and wherever, possible. In 2010 she found dedicated studio space at a pottery in Edinburgh, and began to exhibit and sell her work. 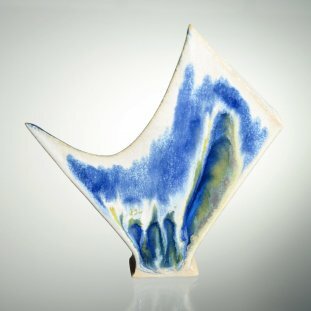 Now based at her own studio in the Borders, she works exclusively as a hand-builder, concentrating on slab-built forms. Each piece is built from multiple slabs cut from templates of her own design, which are then carefully joined – rather like cutting fabric using a dress-makers’ pattern except that she designs and makes the patterns herself, and there’s no handy sewing machine to fasten it all together! 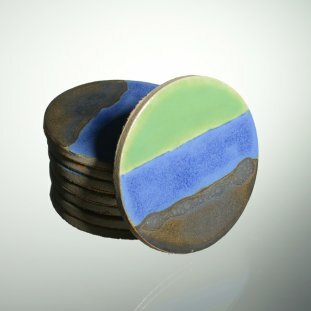 Helen uses brush-on glazes, hand-painting each piece individually. She takes inspiration from many sources: images of Grand Prismatic Spring in Yellowstone National Park were the direct inspiration for several of the bowls, and led to the wider theme of pools – woodland, volcanic, seaside – for others. 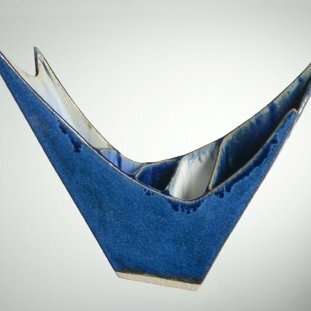 She continues to experiment with a number of stoneware clays, exploring their differing qualities and strengths for particular shapes, their resilience to the increased stress created by larger pieces, and the way in which they alter the effects produced by different glazes.